The WB9000 is designed and manufactured in the U.S.A. for geo-membrane installation. With its durable 2-hp motor the 9000, can conquer any job related to PE, PP liners, and pipes. The 9000 also come with its own reliable pre-heat source. Shipping includes the WB9000, Blank tip, Instructions, and a Case. Powerful drive motor with and custom built motor armature and field with warranty. Military standard connectors for control box which can last through the roughest weather conditions. 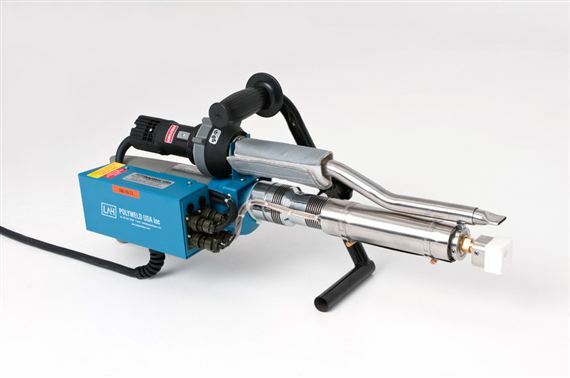 Handle doubles as a stand, making it nearly impossible to tip welder over, preventing pre-heat air from burning a hole in the liner material. Non-Twisting rod feed design makes it easier to manage welding rod. Works with 4 or 5MM rod. Teflon tips are available in pre-machined design of inside corner, outside corner, custom design, or blanks. Dimensions 7" x 29" x 11"